I can't honestly call this kitchen project a renovation. That would assume some major amounts of drywall dust and construction that really just didn't happen. It is really a kitchen spiff-up, which took mostly paint, stain, and elbow grease. It also took a lot of time, but mostly because my life is a little insane right now. 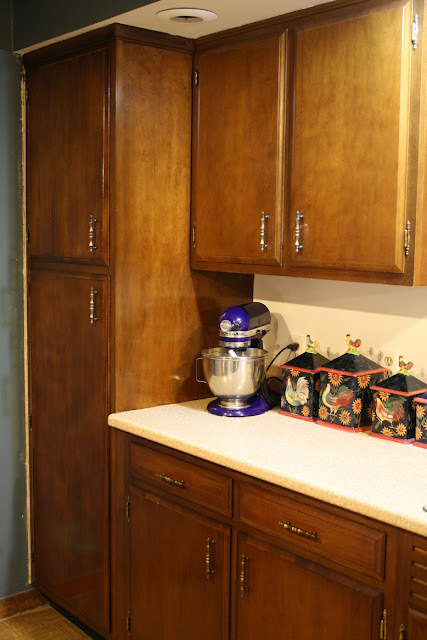 I've decided I'm going to do this kitchen reveal in a series of smaller posts, because I don't have the attention span or stamina right now for a monster post. Also, I'm still trying to figure out a curtain for a window that's just to the left of the photo above. I'm going to work my way around the room until I've cussed that into submission. Right now it just looks stupid, and I'm trying to find a way to un-stupid it. There's no reason why we can't start the tour while I do that. 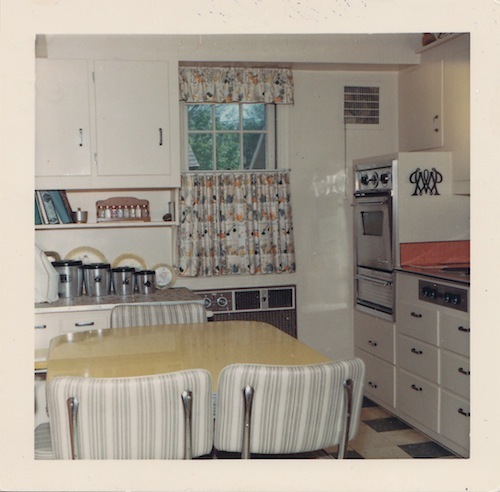 My house dates from 1939, but the kitchen was redone somewhere between 1968 to mid-1970s. The owners at that time changed the layout by taking down a wall, expanding into a mudroom entry area and turning it into an eat-in, and moving the stove to the other side of the room, creating what I call a "wide galley" layout. Since the cabinets are good quality and budget was a concern, I decided to work with what I had. 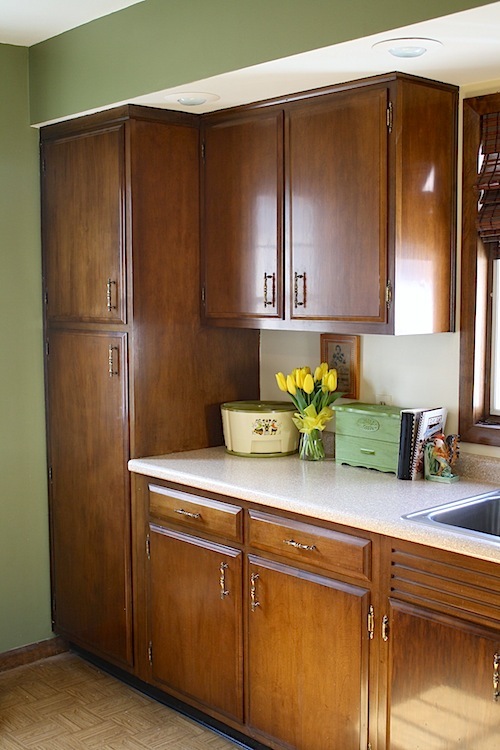 That involved making choices that would fit in with the 1960s-70s style of cabinets. Made curtains to replace tired beige tab-top panels. Here the countertop had been replaced and the cabinets were mid-refinishing, though it's impossible to tell in this photo. The previous color of the kitchen was a medium dark blue, which was painted over switch plates, spattered onto the baseboard trim, and was finger-printed, gashed, and greasy. Ew. 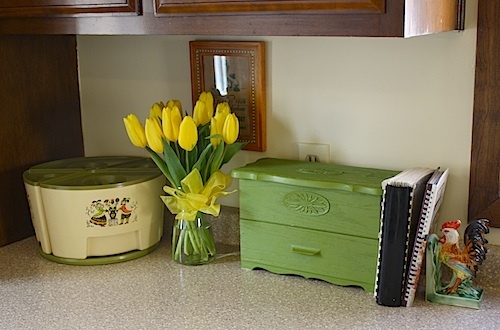 The container set on the countertop is one that I still like because of the kitschy chickens, but took up too much counter space. Ditto the stand mixer. The container set is still in use but stashed in the pantry cupboard on the left. The stand mixer went into the cabinet underneath, and just gets hauled out for the big baking marathons. I purchased the recipe box on a whim about two years ago, feeling drawn to it but not realizing why. 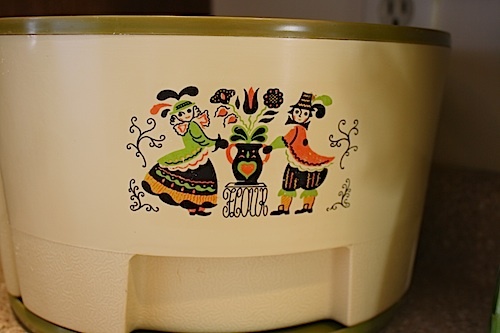 My Aunt Karen has the same one in brown in her own kitchen, where I spent a large portion of my childhood. 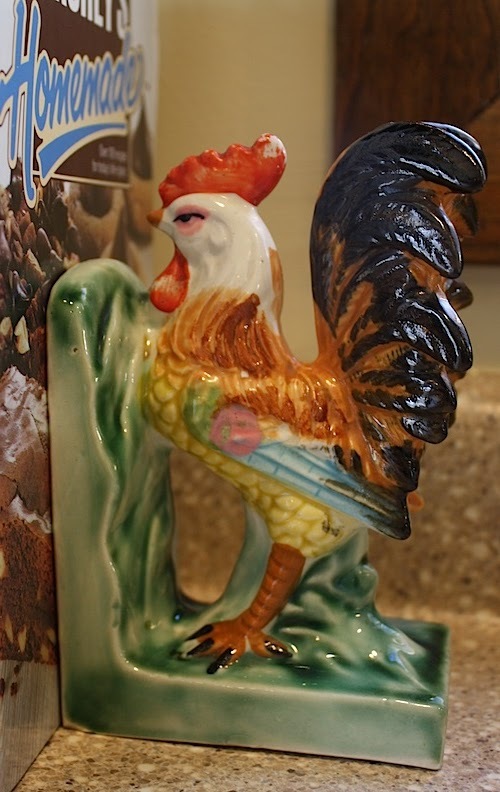 The rooster bookend was a bargain at a junk shop many years ago, because his mate was long lost. He's holding up two cookbooks that are in heavy use in my house: A 1950s community cookbook from Shenandoah, Iowa, called "Kitchen Klatter,"and a Hershey's Cocoa cookbook from mail order. Neither are very pretty and the Kitchen Klatter cookbook is downright ragged, but it's real life around here. The frame on the backsplash, which doesn't show up well in the photos because of reflected light, is holding a paper bag from a grocery store that my Grandad worked at when he was a young man. I have no idea how this paper bag survived 60-plus years, but there it is. I sometimes marvel at its existence. 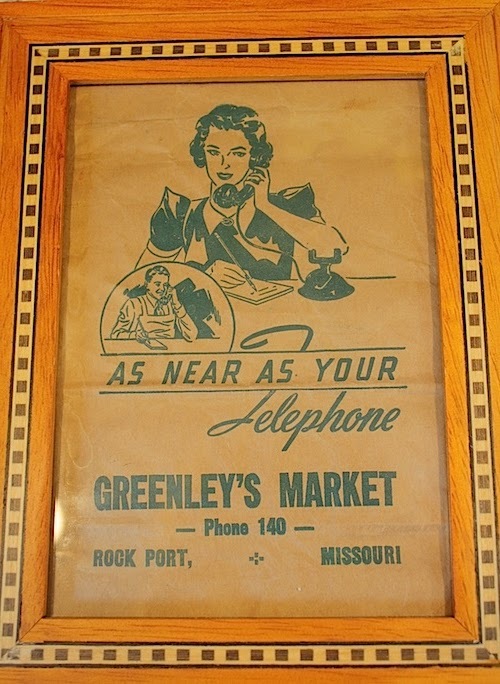 Greenley's Market, sadly, is like many small town main street grocers-- long gone. By next week, I should be parading you down to the other side of the sink, and some territories over by the stove. By that time I hope to have the last curtain looking significantly less stupid, and more fun stuff to share. Stay tuned! I love the small details in your kitchen. And the fact that you worked with what you've got. 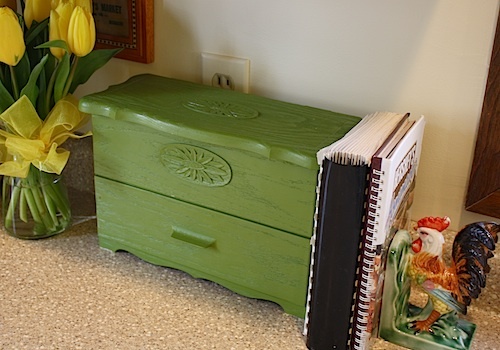 And that you're blogging in the same way you do renovations--small pieces at a time. Because that's the way most of us have to do it. Really looking forward to seeing what else you've done. Your cabinets look gorgeous. And reusing them is very eco-friendly! Kudos to you. Love the cabinets... Would you be willing to share the type and color stain used on the cabinets?? Thanks in advance! I'm sorry this took so long to get back to you, Anon, I had to hunt it down because we had used up the product and I couldn't just go look on my shelf. We used Minwax Dark Walut no. 2716. Keep in mind this was used to rehabilitate and touch up already existing stain, so the result may not be exactly what you're seeing in the picture. The tones were very similar, though. We also used Minwax wipe on poly satin finish. Hope that helps!.